On September 14-15, a conference promoted by Fundação Francisco Manuel dos Santos, launched a large debate about how Portugal will be in 2030. One of the topics subject to discussion was ageing and the challenges it poses to the Welfare State. During that weekend, the debate was also extended to the media. As expected, the skeptics appeared and presented ageing as an enemy, responsible for jeopardizing the sustainability of the Welfare State and for uncontrollable health expenditures in the future. From my point of view, it is impossible to reach those conclusions with such certainty, as far as we are in 2012. The Welfare State is not an unchangeable concept – instead, it is an emanation from society aimed at answering to the most imperative problems concerned with well-being. Therefore, since problems are continuously changing, new challenges require new and more prepared answers. Here, we must recall our first lesson from statistics: correlation does not imply causation. In fact, there is a strong positive correlation between the 2 variables: the weight of population aged more than 65 is growing and public health expenditures have also been growing (and also private expenditures, though not mentioned). The main difference is that public health expenditures have been growing very much faster. As predicted by the Grossman model, the older we are the more healthcare we demand. It is also important to recognize that older people cost more to the system – they are more likely to have chronic diseases, cardiac problems, dementia and diabetes, which require longer stays in hospitals. However, the ageing effect is somewhat overvalued, since other factors have contributed more decisively to health expenditures growth. Barros (1998) confirms that ageing is of less importance for healthcare expenditures than usually pointed out – his estimates suggest that ageing has no explanatory power on healthcare expenditures. Since ageing has a strong impact on other aspects of the Welfare State, mainly retirement pensions, there is a common extrapolation to healthcare services of this demographic pressure. Nevertheless, at the same time, urban middle-classes with rising incomes, new needs and preferences, also originated a fast-growing demand for healthcare. But, more importantly, we have the role of cost drivers: medical and technological advances (new equipment and better OR conditions) have increased costs and healthcare services have also become more expensive (inflation). In my opinion, the impact of ageing population alone will not be responsible for uncontrollable health expenditures in the future. Furthermore, we cannot also forget that devoting more resources to the health sector can potentially increase life-expectancy. This also means that in the medium/long-run, since individuals live longer, they will tend to invest more in education and increase the stock of human capital, with a likely positive impact on economic growth. However, more population above 65 also means the possibility of lobbying in order to change government policies in favor of their interests: withdrawing resources from youth (e.g. : sports and education) to employ in a higher budget for healthcare. Which effect will prevail? Well, in 2030, I will surely have a better answer! Barros, P.P., 1998, “The black-box of health care growth determinants”, Health Economics, 7(6). 533-544. 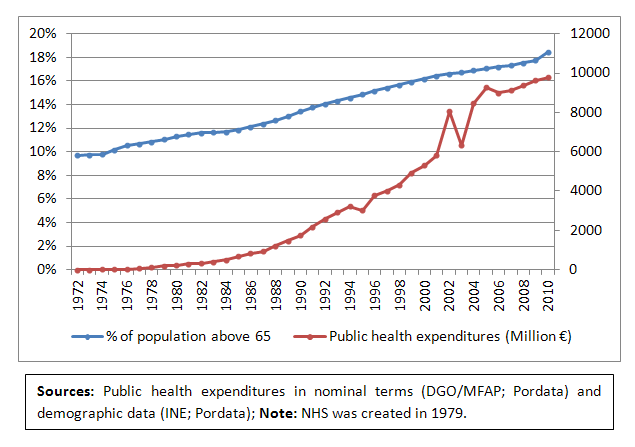 Categories: Ageing, Health Economics, Health expenditures | Tags: ageing, health expenditures growth, Portugal | Permalink.